In postwar Liberia Clarice Gargard searches the truth concerning her father's dubious connection to warlord Charles Taylor. Daddy and the Warlord is directed by Shamira Raphaela, Clarice Gargard(co-director) and was released on TBA. 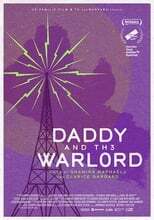 Director Shamira Raphaela, Clarice Gargard(co-director)'s Documentary movie Daddy and the Warlord is produced by De Familie Film & TV & BNNVARA & was released 2019-03-24.